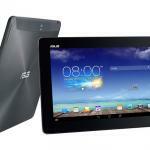 Tablets have stolen the spotlight lately from netbooks – but the Asus Eee Pad Transformer is actually both. At first glance the device looks like most other 10-inch laptops with a full keyboard and trackpad. But the Eee Pad isn’t called a Transformer for nothing. The screen can be detached and used as a touchscreen tablet. This “best of both worlds” product offers everything we love about a laptop – the physical keyboard, trackpad and USB connections. 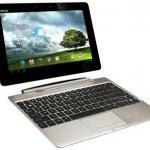 Yet in tablet mode the Asus Eee Pad Tranformer is surprisingly capable and is on par with other dedicated Android tablets like the Motorola Xoom and Samsung Galaxy Tab 10.1v. 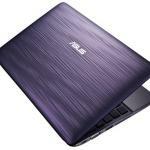 In laptop mode the Asus Eee PC Transformer is a little thicker than your average 10-inch netbook and with good reason. But it’s not massively oversized and heavy – it weighs only 680g. The outside of the product has a nice textured feel with smooth metal edges. Around the edges of the base keyboard are two USB ports, charging port and an SD card slot. The full qwerty keyboard includes a row of function keys and number keys and is easy to type on. On the tablet, users will find a microSD card slot, mini HDMI slot to play full high definition videos on a flatscreen TV plus volume up and down keys, a 3.5mm headphone jack and an on/off sleep/wake button. The 10.1-inch LED backlit screen has a resolution of 1280 x 800 with a 1.2 megapixel front camera and a 5 megapixel rear camera. To detach the screen an unlock key on the dock can free it into tablet mode. It is easy to release and just as easy to click back in place. The Asus Eee Pad Transformer is powered by an NVIDIA Tegra 2 dual core processor and it’s not hard to notice the speedy performance. The device is running Android 3.0 Honeycomb with support for Flash 10.2 so websites are going to look just like they do on a larger laptop or desktop computer. 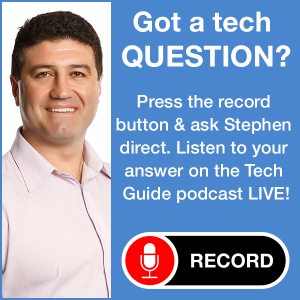 We enjoyed Android in laptop mode – something not many other companies can offer and, as a laptop operating system, Android was easily up to the task. The trackpad helped us navigate the system pretty easily but we still found ourselves touching the screen to scroll between home screen. 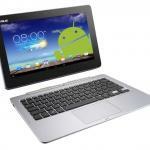 In tablet mode, the Eee Pas Transformer is as good as other dedicated tablet products on the market. The device has a responsive touchscreen which made navigation a breeze along with typing on the virtual on-screen keyboard. But, as is the case with many users, users tend to favour a physical keyboard when they need to write and edit longer messages and documents. So rather than wishing you has a physical keyboard or carrying around Bluetooth keyboard, the Eee Pad Transformer can simply be docked quickly and easily. Without missing a beat the keyboard was ready to use the second the screen is reconnected to the base. Another advantage the base offers besides the physical keyboard is the on-board battery. When combined with the battery on the tablet/screen, users have an incredible 16 hours of use. If the screen is low on battery connecting it to the base provides that boost and vice versa. The Eee Pad Transformer is wi-fi only so connecting to the internet outside of a wi-fi zone can be achieved by physically or wirelessly tethering a smartphone. 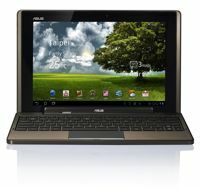 The Asus Eee Pad Transformer really provides the best of both worlds – as a tablet and as a netbook. It cleverly addresses the main criticisms of a lack of physical keyboard and USB ports with the keyboard dock while the screen offers an uncompromised tablet experience in its own right. 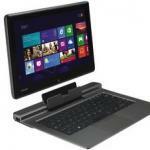 The device will be available in two versions – 16GB standalone tablet model and a 32GB version with the dock included. Now 16GB on its own is priced at $599 with the additional setting you back another $199. But the 32GB version with the dock included is priced at $799 – the same price as the separate purchase of the 16GB tablet and dock if you decide to buy it later. 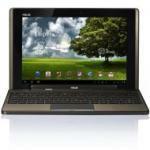 If users can’t decide between a quality netbook and a quality tablet then buying the Asus Eee Pad Transformer means you’ll actually have them both. Price: 16GB wi-fi $599, additional dock $199. 32GB wi-fi tablet and included dock $799.